C. Lowry Barnes (center), M.D., was invested in the Carl L. Nelson, M.D., Distinguished Chair in Orthopaedic Surgery on June 1 by UAMS Chancellor Dan Rahn (right), M.D., and UAMS Executive Vice Chancellor and College of Medicine Dean Pope L. Moseley (left), M.D. Barnes has served as chair of the UAMS College of Medicine's Department of Orthopaedic Surgery since 2014. June 2, 2017 | June 2, 2017 | C. Lowry Barnes, M.D., chair of the University of Arkansas for Medical Sciences (UAMS) College of Medicine’s Department of Orthopaedic Surgery, was invested June 1 in the Carl L. Nelson, M.D., Distinguished Chair in Orthopaedic Surgery. 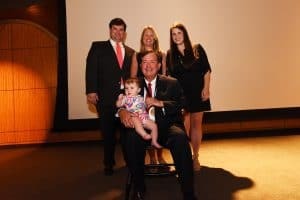 Barnes, who graduated with honors from the College of Medicine in 1986 and completed his internship and residency in orthopaedic surgery at UAMS, has served as department chair since August 2014. 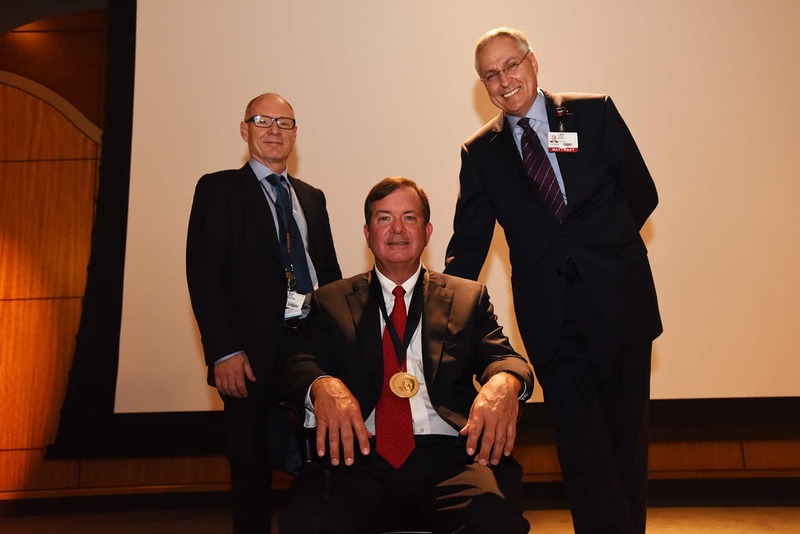 He was presented the chair medallion by UAMS Chancellor Dan Rahn, M.D., and UAMS Executive Vice Chancellor and College of Medicine Dean Pope L. Moseley, M.D. UAMS Chancellor Dan Rahn, M.D., speaks at Barnes’ investiture. An endowed chair is among the highest academic honors a university can bestow on a faculty member. A distinguished chair is established with gifts of at least $1.5 million, which are invested and the interest proceeds used to support the educational, research and clinical activities of the chair holder. Those named to a chair are among the most highly regarded scientists, physicians and professors in their fields. The chair is named in honor of Carl L. Nelson, M.D., a world-renowned expert in joint replacement who served as chairman of the UAMS Department of Orthopaedic Surgery from 1974 until his death in 2005. He oversaw the education of 122 orthopaedic surgeons, many of whom stayed in Arkansas to practice, including Barnes. Barnes is one of Arkansas’ and the region’s foremost joint replacement experts. He holds four patents for orthopaedic surgery devices and has designed numerous hip and knee implants. 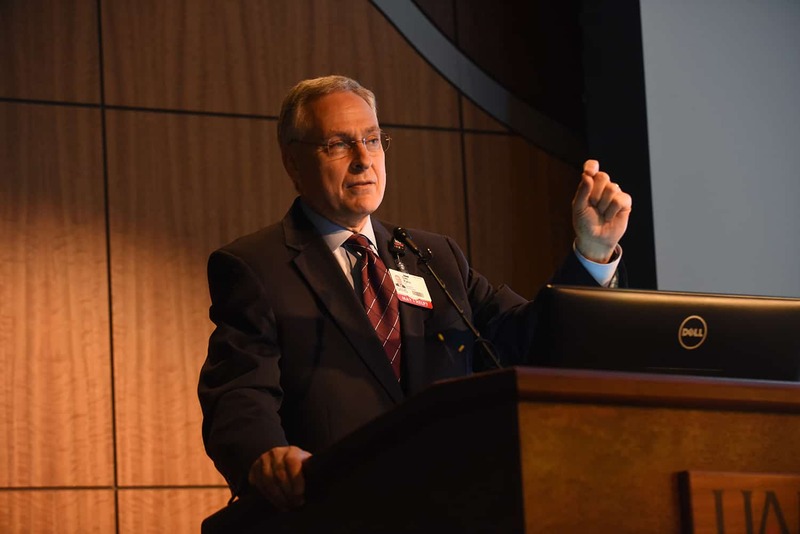 He lectures nationally and internationally on total joint replacement surgery and has been active in hip and knee research. Barnes established the HipKnee Arkansas Foundation to further study patients with arthritis. Tom S. Butler, retired vice chancellor for Administration and Governmental Affairs at UAMS and a former patient of Barnes, said in the care he received from Barnes he was most impressed with Barnes and his staff’s concern for the patient beyond the procedure. A special guest was lifelong friend Kevin L. Garvin, M.D., who is now chair of the Department of Orthopaedic Surgery and Rehabilitation at the University of Nebraska Medical Center. Garvin met Barnes as a fourth-year resident at UAMS while Barnes completed his internship. Barnes with his wife, Tanya; son, Chase; daughter, Emily; and granddaughter, Emma Reese. Barnes is a member of the prestigious Knee Society, an exclusive organization of the world’s experts in orthopaedic surgery. He is the only Arkansas member since Nelson’s death. Nelson came to UAMS in 1974 to develop the Department of Orthopaedic Surgery and organize the orthopaedic training program. He produced more than 200 peer-reviewed scientific publications on topics including orthopaedic education, musculoskeletal infection, psychomotor skills and bloodless surgery. “I was very lucky to have been educated by Dr. Nelson,” said Barnes.